The Welsh capital of Cardiff is one of Europe’s most multicultural and cosmopolitan cities. With an incredibly rich history and a proud embrace of the cultures of both its Welsh and international residents, Cardiff is an increasingly exciting place to both live and work. So for those thinking of moving to Cardiff, this guide may just be able to help you find a suburb that suits your individual needs. Growing at a rapid pace, Cardiff offers a seemingly never ending variety of things to do and places to go. From hot new restaurants to literary festivals, and a new profile on the world stage from hosting events like the Champion’s League in 2017, there's truly something for everyone in Europe’s youngest capital. With a lower cost of living than most capital cities, and recent regeneration projects leading to the development of the Cardiff Bay waterfront into a bustling hive of eateries and bars, and the construction of popular attractions the National Assembly building and the Wales Millennium Centre. Cardiff is an ever popular choice with both families and young professionals looking to build some roots in one of the UK’s most attractive cities. One of Cardiff’s biggest attractions is its diversity of locations, offering you the option of living in the beautiful waterfront of Cardiff Bay, right in the centre of the urban sprawl, or in the middle of the beautiful countryside. The only thing that’s difficult about settling down in Cardiff is choosing where. Where Should You Live in Cardiff? Choosing where to live depends as much on you, as it does on the city you’re moving to. And with a massive variety of areas, moving to Cardiff provides you with the opportunity to be really selective about how, and where, you choose to settle down. As removal company in Cardiff we're going to give you the lowdown on the best places to live based on your needs. As a big city for higher education, with two universities, Cardiff and Cardiff Met, and the Royal Welsh College of Music and Drama, Cardiff has some excellent options for those who don’t want to live in their university halls of residence. Popular with students since the establishment of the Universities, Cathays is the main area that students live in. Due in part to its close proximity to the university buildings, but largely due to the huge community feel of the area, which is as much a part of university life as the actual university itself. If you’re a young professional, a post graduate or even a young family, Roath offers a great mixture of both the social and cultural aspects of Cardiff. With a number of independent restaurants and bars, small galleries and The Globe, your go to spot for live music - and not to be confused with Shakespeare - Roath provides more than enough entertainment without having to make the short walk to the city centre. Roath park should also get a mention, as a great place to take children to play in, or to hire out one of the rowing boats on the lake for a great first date. As a general rule, the further you are from the city centre, the more family friendly the areas become. Located in the north east, Cyncoed is one of the most sought-after places in Cardiff, although it does come with a property price to match. Similarly, with its combination of semi-detached, terraced houses and large gardens, Victoria Park is another hot spot for growing families. With a number of well regarded and high performing schools, Cardiff offers quality education to all ages. Cathays High School and Cardiff High School are two well-regarded state secondary schools, alongside over 30 primary schools to choose from and few high ranking independent schools, such as Llandaff. Roath’s big sister, Pontcanna, is one of the more affluent areas of Cardiff and a popular choice with professionals. The price of properties here are equal to, or higher, that the more upmarket areas of Roath and is similar in its genetic make-up, with it’s own range of restaurants, bars and shops. In 2017, the Centre for Economic and Business Research and the Royal Mail conducted their annual survey, calculating the most desirable postcodes to live in in Wales. Based on a number of factors, such as access to high quality schooling and green spaces, average working hours and quality of life statistics, and researched via number of data sources including the 2011 Census, the Department for Communities and Local Government's Indices of Multiple Deprivation and General Land Use database, the list, covering all areas of Wales, is comprehensive. In line with the rapid growth of this cosmopolitan city, we’re pleased to announce that more than half of the most desirable places to live and work in Wales are located within or around Cardiff, in comparison to the two slots Cardiff won in 2015. Some of these postcodes we’ve already mentioned above, but here’s a quick list of the Cardiff based postcodes to help you narrow down your search! CF62 - Barry, after a massive multi-million pound investment to refurbish and redevelop the waterfront over the last few years, and the awarding of a prestigious blue flag, it’s no wonder that Barry waterfront has been awarded a spot on the list. Including areas like: Barry, Rhoose, St Athan, Llancarfan, Barry Island. CF5 - Cardiff West, covering: Ely, Caerau, Canton, Leckwith, Fairwater, Danescourt, Llandaff, Riverside, Wenvoe, Peterston Super Ely, St George’s Super Ely and Michaelston. CF11 - Cardiff Central, for Cardiff Bay and Grangetown. If you are planning on moving to Cardiff and its surrounding suburbs, then you have a lot of choice in terms of where you want to settle. Whether you want an inner city location or a more leafy suburb (or something in between), we’ve put together this guide to help you decide on the best place for you and your needs. Roath is located just a couple of miles from the city centre and is an excellent location for young professionals. The area has multiple tree-lined avenues and several streets featuring terraced houses from the Victorian era. Many local amenities can be found close by, with the main shopping streets being Albany Road, City Road and Wellfield Road. There are plenty of cafes and restaurants, as well as pubs and bars too. Characterised by a diverse community, Roath’s population includes a lot of students and graduates thanks to its close proximity to Cardiff University. It is also an ideal location for fans of music, art and literature due to the Made in Roath arts festival which takes place every October. Historical sites include a nineteenth-century villa built on the site of the medieval manor house of Roath, plus the 150-year old St. Margaret’s church, which also houses the intriguingly opulent Bute Mausoleum. The area is further enhanced by the beautiful Roath Park which includes a beautiful lake as well as botanical gardens, pleasure gardens and a recreation ground. Roath is a perfect location for anyone seeking a balance of city and town centre life with plenty of picturesque scenery to enjoy too. Cathays is also renowned for its high student population due to its proximity to Cardiff University. The area is quite densely populated by the local community, with the architectural characteristics having a Victorian feel thanks to the many older terraced houses that feature along many of the residential streets. Despite significant urbanisation over the years, the area has managed to maintain extensive parkland thanks to local places such as Bute Park, Blackweir, Gorsedd Gardens and Queen Alexandra Gardens. The eastern end of Cathays is home to the local train station which serves Cardiff city centre as well as other popular locations like Merthyr Tydfil and Aberdare. The Sherman Theatre and Cardiff gym are both close-by, while there is a particular abundance of trendy coffee shops. Local attractions include the National Museum Cardiff which has collections of archaeology, botany, geology and zoology, as well as fine and applied art. The Welsh National War Memorial is also located in Alexandra Gardens in Cathays Park, also known as the Cardiff Civic Centre, which itself consists of several early-twentieth century buildings. Crown Buildings, which are the Welsh Government’s main offices, are also located here, so there is extra appeal here in Cathays for anyone working for the Welsh Assembly (or interested in getting into politics). Llandaff is one of the quieter places to live around the suburbs of Cardiff, yet still has many interesting features that make it an excellent choice to live in. This suburb consists of quaint villages, many with historic buildings from the medieval era, as well as many unique eateries and cafes which enhance the local experience. 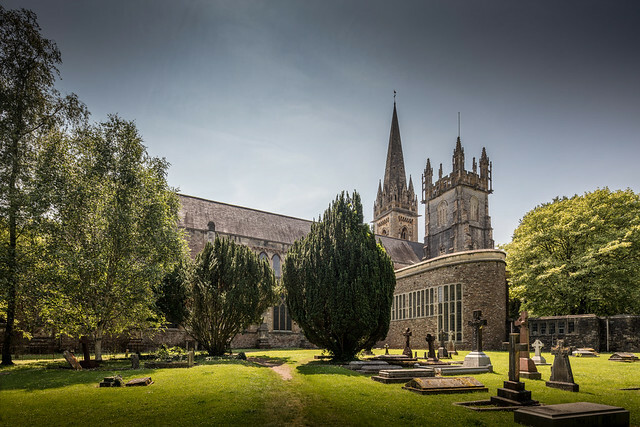 Originally built in the twelfth century, the medieval and gothic Llandaff Cathedral is one of two in the Cardiff area and the only one that also serves as an Anglican parish church. Llandaff is also notable for being the birthplace of author Roald Dahl, as well as the previous location of the BBC Wales production studio before it was relocated to Cardiff Bay. In fact, four episodes of the revived Doctor Who television show feature scenes shot in Llandaff, two from David Tennant’s turn as the Doctor and two from Matt Smith’s. Despite the quietness of Llandaff, it is still within walking distance of the city centre. It is also heralded as a good area for families to live in as there are excellent schools located nearby. There are popular Welsh language primary and secondary schools as well as English language schools, plus there is the Llandaff campus of Cardiff University. The multicultural Cardiff Bay is probably one of Cardiff’s most vibrant and exciting suburbs to live in, due to its access to bars, restaurants, and other leisure and entertainment venues. Some of Carfiff’s best restaurants and bars are here, making for a vibrant nightlife scene. Two notable attractions in this area are the Senedd, home of the National Assembly for Wales, and Techniquest, a science and discovery centre. The Wales Millennium Centre, where you can see theatre shows, musicals, concerts and comedy, is also located in Cardiff Bay. Other interesting sights include the Norwegian Church Arts Centre and the vibrant and captivating waterfront, Mermaid Quay. The whole area benefits from beautiful scenery and multiple artistic sculptures, and there are many annual festivals and events to enjoy too. The BBC Wales production studio is also now situated in Cardiff Bay as well, so Doctor Who fans can regularly see the crew filming scenes around town during production. Transport is excellent in Cardiff Bay with regular trains running around every 12 minutes, as well as the hourly Aquabus which offers a more leisurely and scenic route of travel. If you want to live in an affluent Cardiff suburb that boasts wonderful views of the surrounding mountains, then you must consider moving to Cyncoed. It is a particularly ideal location for families due to the abundance of good schools, most notably Rhydypenau Primary School and Cardiff High School which are two of the highest performing schools in the city. There is also a hall of residence for Cardiff University and a campus for Cardiff Metropolitan University. While the good schools in the area does mean property prices tend to be higher in Cyncoed than in other suburbs of Cardiff, there are many other benefits that come with those higher property prices. One of these is the closeness of Roath Park with its lake and multiple gardens to enjoy nature, especially handy for dog owners. The mountainous views that surround the area also provide this place with spectacularly beautiful scenery all year round. Public transport is fairly basic but reliable in Cyncoed, with buses that can take you to straight to Cardiff Central bus station and various other train stations.